Caltowie, Pompoota, Murray Bridge, Moorak, Mil Lel, Adelaide, all in South Australia. The following autobiography is the work of the late Dean Saegenschnitter, who collected and compiled ‘Before and After’, a Family History of the Saegenschnitter descendants of Auguste Emilie Lydia Becker and Carl Friedrich Gustav Saegenschnitter. I was born at Laura on the 10th July, 1928. Living with my parents who had a small farm in the Caltowie district in South Australia. I was Baptised at the Pine Creek Lutheran Church by the late Pastor Ern Stolz, just a few weeks after his induction into the Parish. In 1929 the parents sold the then too small farm and then purchased a dairy in the irrigated settlement of Pompoota, located between Mannum and Murray Bridge. Besides milking 30 odd cows they also had 300 fowls and a small number of breeding sows, selling the young from the sows as suckers. I attended the small school at Pompoota, completing my Q.C. in 1941. Then leaving school to help on the farm, this was to offset Mums poor health. 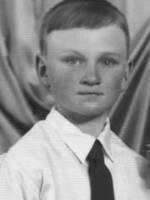 In 1942 I attended religious instruction at Murray Bridge, and then confirmed on 1st November 1941 by Pastor John Doehler. During 1943-44, which were drought years, we suffered mice and rabbit plagues, this had one good aspect, it enabled me to trap the rabbits, selling skins and carcases. The return from this enabled me to buy my 1st. bike, thus enabling me to go to Murray Bridge to the pictures on some Saturday nights, a trip of 15 miles each way. After milking the cows, the milk had to be carted to a wharf about one mile away, here the cans of milk were collected by boat for delivery to the Farmers Union factory at Murray Bridge. This was collected twice daily during the summer months and once during winter months. This boat also delivered any produce for the various farmers, for us, butter, cheese. meat, fowl feed and super.. The river collection ceased in 1944, being taken over by a truck at the dairy door. In 1947 the parents sold the dairy, due to Mum’s poor health, we moved to Murray Bridge, there having a house built. Dad went to work in Farmers Union factory in the boiler room. I later joined him there, but going into the milk receival area, so one day I were sending, the next receiving. As time progressed I moved into various areas such as casein making, powdered milk and finally cheese makng. Starting as a factory hand, then cheesemaker, and then assistant foreman. In 19481 joined one of the local football clubs, there to play a sport I greatly loved, prior to now never had any opportunity to learn or participate. This I thoroughly enjoyed. It was here that I met a fellow who was getting married, he asked me to be his Best-man. It was through this I met Ronda Cooper, she was the bride’s sister. Mum after long health problems, finally passed away on august 1952, she was laid to rest in Murray Bridge. In October 1952 Ronda and I became engaged, then married on the 14th. February 1953 by Pastor John Doehler, in the Swanport Rd. Lythcran Church. Later that year we bought a 2 roomed dwelling with an enclosed back. Dad then came to live with us, but unfortunately was unable to cope with with the loss of Mum, he ended his life in October 1953. In the beginning of 1956 I added more rooms to our dwelling, this was needed for the additions to the family. The first of our daughters arrived on 5th November 1954, the second on 29th July 1956, and the 3rd. on the 3rd November 1958. All were bor in Murray Bridge, and all were baptised by the same Pastor and in the same church that Ronda and I were married in. In early 1961 I was offered a job at Moorak, just south of Mount Gambier, by Farmers Union, This was a promotion. Initially boarding till a trust home became available for us. This took place in May 1961. The two older girls went to the North Gambier primary school. Our fourth daughter was bom on 26th December 1962. I stayed at Moorak for 3 !/2 years, then to Kraft at Mil Lel for a few months, then to Glencoe for 13 months, this proved unsatisfactory, the opportunity came so I went back to Kraft at Mil Lel living in a company house. I remained here till I retired on 2nd. January 1992. I startedcd at Mil Lel as foreman cheesemaker, finishing in the position of Services Manager. I was responsible for all the milk collection in the South East and part of Western Victoria, its distribution to the four Kraft factories as well the Co-op. The girls all went to Mil Lei primary school which was about one mile away. Fortunately a school bus passed our front door so they travelled by this for their primary education at Mil Lei, and later their secondry, in Mount Gambier. The girls were all Confirmed in the Mount Gambier Lutheran Church. Some time after the youngest daughter commenced school, Ronda went to working in Mount Gambier 11 Kms away, firstly to a laundry, then Fletcher Jones, and finally Oaks Nursing Home. The last she enjoyed the most because of her ability in dealing with older people. She remained there until she was injured in ,1986. After Ronda started working. we had our first real holiday, I took some long service leave, firstly going to see the youngest daughter who lived in Copely, then driving to Brisbane to see our 3rd daughter, then travelling down the east coast via Sydney, then to Canberra, and then home. During the time Ronda worked, we purchased a house in Klemzig. This later was sold and we bought another in Plymton Park. This was to have been for our retirement, but unfortunately Ronda in early 1988 was diagnosed to have Emphysema, finally ending her life on 12th August 1989. She was laid to rest in the Garden cemetery Mt Gambier. In 1990 I decided to sell the Plymton Pk home, and this enabled me to buy a Unit in the Tea Tree Gardens Retirement Village. This was finalised on the same day as Grandson Thomas Minge’s birthday, the same day I bought the car, this all taking place on Friday 13!h. 1990 which proved to be my lucky day. After aquiring the Unit I used it whenever coming to Adelaide. Actually in 1991 I came to Adelaide 13 times, up to my retirement. On the Easter weekend 19911 met Melva Fair, a widow in this Village, this progressed to her consenting to marry me. This took place on the 4th July 1992, in the Dernancourt Lutheran Church, the ceremony conducted by Pastor Ray Schmidt. Melva’s brother Les and my daughter Wendy were our witnesses. Melva and I have a lot in common, she was born at Mambray Creek which is on the western side of the Flinders Ranges. I was born at Laura on the eastern side, only a few miles apart, and both of us come from a farming background. The final aspect is that we both like Aussie football, and align ourselves to the same Club. Both of us have become involved in Village activities, including committees. The Village presents plenty of scope, because of its size. We are very greatful to Our Heavenly Father to be given me another opportunity to form a Partnership, and living in a pleasant environment, which is mutually agreeable and giving us a contented and happy companionship. On the 4th. July 2002, we celebrate our 10th. Anniversary.